Performance ranges from 80-200 pcs/min (depending on product dimensions and label size), up to 300 pcs/min in dedicated configurations. 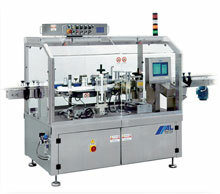 The solid and compact base can accommodate ALstep or ALritma series label applicators in an easy-access protective cabinet. ALline C can use various types of conveyors for product transport, both slatted (in plastic or in steel) or belt types, of various sizes. Various different devices are available for product spacing, depending on the required product type and performance. These give the possibility to label in-phase with print registration or elements present on the product itself. Adjusting the different units for format/product changes is simple, high-precision and intuitive; the labelling head is equipped with a function to save the parameters for a specific label-product combination, so they can be easily recalled with a code. The ALline C labeller can be equipped with a wide range of label printing units, for dry, hot or thermal transfer (SATO or compatible) printing of text, expiry dates and barcodes. Label application confirmation with automatic expulsion.